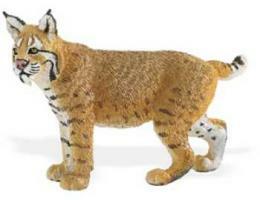 Bobcat Lynx Plush Stuffed Animal Toy Cuddlekins is wildlife love fantastic from at Anwo.com Animal World®. Featuring a realistic look this Bobcat Lynx Plush stuffed animal toy is educational, creative, stimulating play fun and measures 12" long x 10" high x 10" wide. Shop our Bobcat Gifts Store at Anwo.com Animal World® page for additional Bobcat gift items.